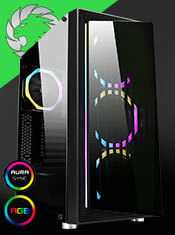 The CiT Beam is a MATX PC gaming case with a difference, the front panel comes with an RGB strip that has 14 different colour modes to choose from and a unique curve. The Beam has an internal layout that is crafted for gamers, with room for eights fans in total and one single-ring Halo Spectrum fan included. Maintaining low temperatures is no problem as the Beam can fit a max radiator size of 240mm at the front / top and a 120mm radiator at the back. Want a clean looking system without worrying about cable management? The hidden cable routing and full length PSU shroud are perfect for building a great looking case. Situated on the top are the I/O ports for easy access. 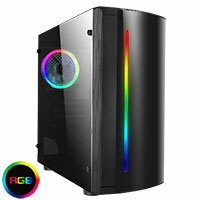 Design - The Beam has been designed with a large RGB strip, a brushed aluminium look that runs down the left side of the front and a fully acrylic left side panel, resulting in a case that look fantastic. Front Panel - The front panel includes an RGB strip and has 14 different colour modes (rainbow, single colour, static, cycle & flow etc). Style your case the way you want! 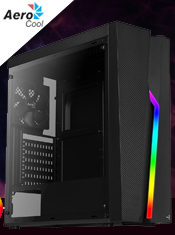 Single-Ring Halo Spectrum Fan Included - As well as an RGB strip the Beam includes a 1 x 120mm single-ring Halo Spectrum fan and with room for another seven fans this case will not only look great but has excellent airflow for when your case works that bit harder. RGB Strip and Fan Sync - The RGB strip and the fan can easily be synced and can be easily changed together using the reset key. Water Cooling Support - As well as supporting eight fans the Beam supports a radiator up to 240mm at the front / top and a 120mm radiator at the back to give you extensive cooling support. Removable Dust Filter - A removable dust filter included at the top of the Beam is included helps to prevent dust from getting into your build and helps improve the performance of your chassis.